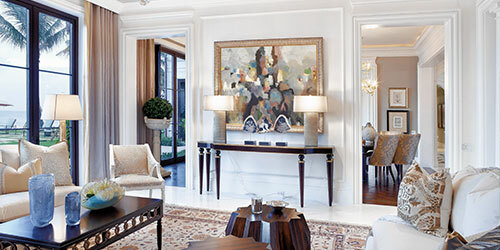 Shannon Callahan and Rachel Ortiz, senior designers at Marc-Michaels Interior Design in Boca Raton and Winter Park, love mixing traditional furnishings with more modern art and accent pieces. National design magazines, including House Beautiful, Southern Living and Traditional Home, have featured the trend. (Search Houzz.com for more examples). We asked Callahan and Ortiz to suggest ways to mix elements of past and future to create a hipper design, and this home in Manalapan illustrates how the mix can work. Classic millwork and furnishings get an easy update here with contemporary painting, neutral upholstery and modern lamps with barrel shades. A pair of wooden, star-shaped accent tables provide a wow factor. 1. Mix traditional art with modern frames or use more contemporary art with traditional frames. 2. Use unique lighting to add contrast on a traditional console table. Or add a contemporary chandelier. 3. Get rid of the chintz and brocade and reupholster with a cleaner and more modern solid-color fabric. 4. If your room is too neutral, give it pizzazz with color. Make it pop with Kelly green or magenta throw pillows. 5. Don’t be afraid to add accent pieces, such as a contemporary coffee table or sculptural accent tables. 6. Replace the traditional rugs with a hip geometric or stylized design.